Hyderabad, February 4: “We can transform our students from being job seekers to job creators by building the proper ecosystem for imparting skill based training in every higher educational institution”, said M Venkaiah Naidu addressing the students of the Dr. D. Rama Naidu Vignana Jyothi Institute of Rural Development and the members of the Vignana Jyothi Society, in Hyderabad on Sunday. Sharing his thoughts on education, the Vice President said that an ideal educational institution must focus on making a student into holistic individuals by equipping them to face the challenges of life with equanimity and stability. He advised educational institutions to employ counsellors to provide support and guidance to students during challenging times. “Education must lay the foundation for developing a society that is strongly grounded in morals, ethics and value systems. There is a need to revamp our education system to improve standards and impart world class learning”, he said lamenting that none of our Indian universities are figured in top ranking global institutions. 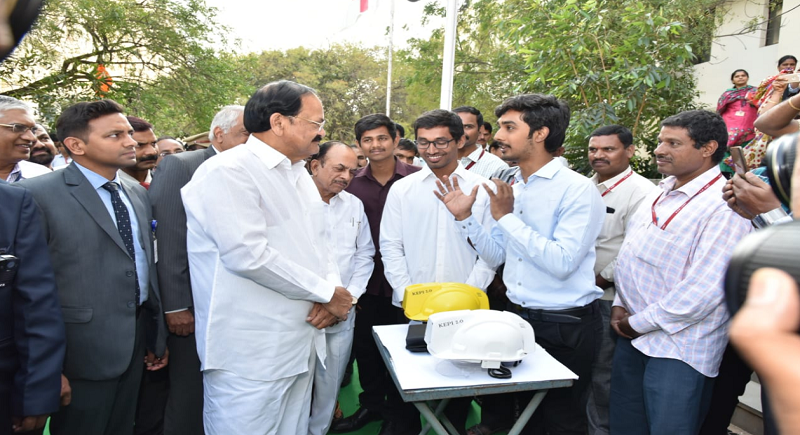 Highlighting the need of educational transformations, Naidu said that, “Education should make students think innovatively and come out with bright, out-of-box solutions to overcome challenges. Our education system should also focus on our traditional crafts, arts and the way we preserve and protect local varieties of seeds”. Stressing at the urgent need to bridge the urban rural divide in terms of education, Naidu lamented that rural youth had limited access to quality educational programmes. “Access to education to all levels is essential for inclusive growth”, he added. Further expressing concern over lack of focus on rural upliftment needs as a result of which unplanned expansion of urban slums was happening, the Vice President urged policy-makers, planners, and civil society to adopt a conscious, pronounced bias towards rural development. Meanwhile, outlining the major challenges faced by agriculture such as declining productivity, diminishing and degrading natural resources, fragmented land holdings, unprecedented climate change, Naidu said that these challenges need to be tackled on a war footing through structural changes and policy interventions from the Union and State Government. “Agriculture should be made profitable and sustainable by encouraging farmers to diversify into allied activities such as bee keeping, poultry, horticulture, sericulture, and dairy”, he said. Further emphasizing the need to focus on food processing in view of the huge potential the sector, he urged towards improving agrarian economy, raise farm incomes, reduce wastages, ensure value addition, promote crop diversification and generate employment opportunities and export earnings.